Note: See the yearly Camaro information under the "Exterior & Interior Color Codes" heading for Specific interior availability, options, fabric samples, interior codes etc.... for the year camaro you wish to research. How do I tell what interior I have, or had? I want to restore my interior - how do I do it? What is the difference between the standard vs. custom interior? What are the differences in door panels? What type of speedometers were used? My speedometer squeeks. How do I fix it? My speedometer reads wrong. How do I calibrate it? Why is my shifter on the steering column? 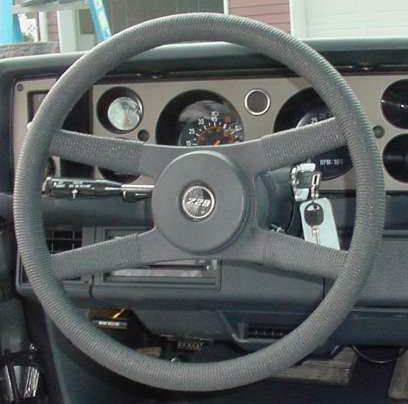 What type of steering wheels were offered? What is the U14 Optional Guage Package? What type of Tachometers were offered? What does a high red-line mean? What type of seats were offered in the Camaro? Q: How do I tell what interior I have, or had? 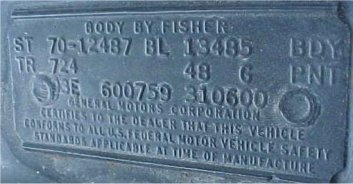 A: You can tell what interior was originally installed in your car by looking for a thin steel plate called the Fisher Body trim tag and decoding the interior trim code. This plate is either rivited or secured with sheet metal screws and it is located on the cowl/firewall area. This tag is also known as a cowl tag among other things. These tags can be decoded/deciphered by using the decoding page, and most yearly camaro info pages have a specfic trim tag decoding example. All yearly camaro information pages have the trim codes listed along with fabric samples. See above: TR 724. "724" is the interior trim code for this car. Q: I want to restore my interior - how do I do it? A: Click here to read the online restoration guide. Also make use of the club message board interior restoration topics forum. Q: What is the difference between the standard vs. custom interior? 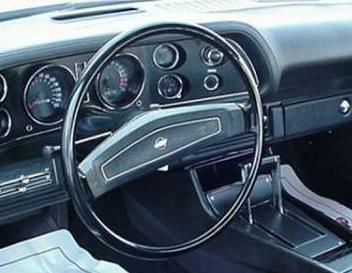 A: Various interior levels were offered in the Camaro over the years. 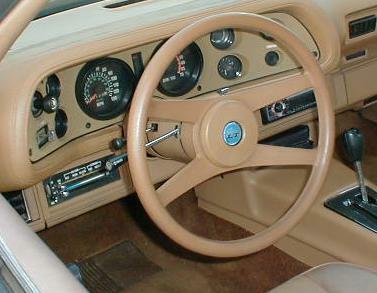 The standard or base interior was automatically installed in the car. It consisted of basic vinyl material and plain interior treatments. Optionally, the customer could order the "custom", (sometimes called "deluxe" which is a carry over from the 60's) interior which usually included more plush seat cover material and various additional packaged option treatments. These options usually included: additional interior lighting, sound insulation, woodgrain appliques on the instrument cluster and door panels, or cloth door panels, etc... Some of these pieces were available as individual options like the woodgrain instrument cluster could be ordered as an option without having to order the complete custom interior. Sometimes, especially in the later 70's there were 4 interior trim levels: standard vinal and optionally - standard cloth, custom vinyl & custom cloth. It's interesting to note that the mid-70's custom interior became the foundation for the base interior of the 78 interior. The Type LT, or Berlinetta models usually had the custom interior installed as base equipment. Q: What type of seats were offered in the Camaro? A: Several styles of seats were offered in the Second Generation Camaro. 1970 was the ONLY year in which a low back seat with separate headrest was used. 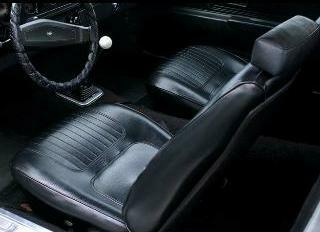 In 1971 the seat was redesigned which incorporated the headrest into the seat itself. These seats are called the high-back seat. It has a rounded top. In 1976 (intended for 1975, with leather?) a fancier "custom" seat was designed to be included as part of the custom interior. It can be identified by the "flat" top. 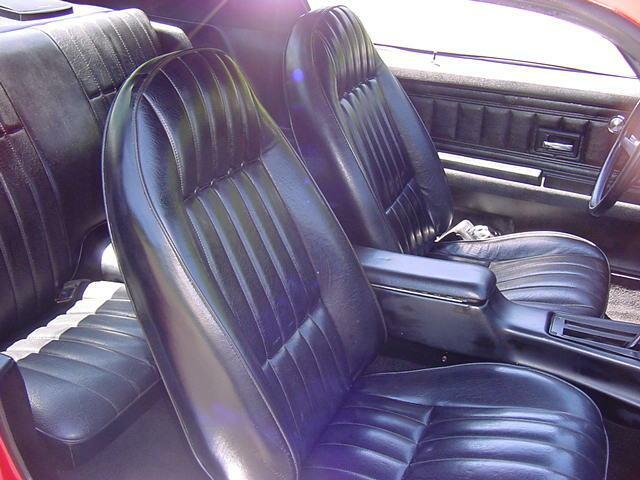 Note, 1975 was the only year leather was even suggested as an available interior material. Leather never made it into any delivered production cars. In this photo (for description purposes only, ignore seat condition please) you can see an early style (1971/72) seat on the left, and a mid 70's seat on the right. Notice the rear plastic backing is a smaller solid panel, whereas on the 73 seat there is a square indentation on the seat. In the later 70's and/or on seats with higher level material, the rear of the seat will be a "zipper back" style. This eliminates the use of this plastic backing piece. Also notice on the bottom of the seat, the early style seat has the seat fabric stretched below it, while the 1973 style seat has a vinal foot cap creating a cleaner look and offering more protection to the lower seat area. Seat Rails: Seat rails are specific to the driver side and passenger side. If you mix the seat rails up, the seat adjuster lever will be in the wrong spot, so it's not easy to screw up. It's usually obvious which rail is for which side. As a general rule, 1970 - 74 seat rails interchange within this year car. In 1975 the passenger floor was redesigned to accomodate the catalytic converter so the passenger seat rail was also redesigned. 1975 - 81 passenger seat rails should interchange between this era car. I believe the seat rails for the custom seat are different than the standard seat, so keep this in mind. Rear Seat: The rear seat is interchangable across all second generation models. It's important to note that prior to mid-1973 the rear seat back was a wire frame with stuffing & burlap padding under the seat cover. This gives the rear seat a "plush" or fuller look. 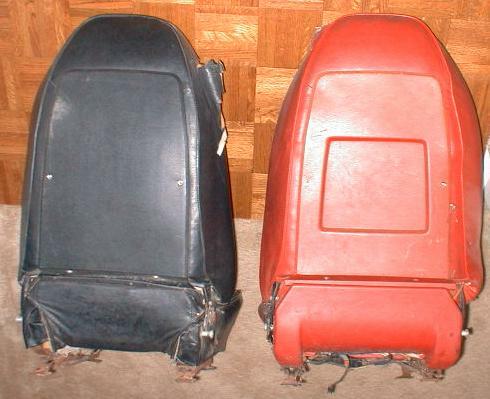 In mid-73 the rear seat used an injection molded full foam insert inside the steel frame. A: The standard instrument cluster guage bezel is black molded plastic. A fancier version will have chrome accenting around the edges. An upgraded cluster bezel was also available which had a woodgrain applique (decal - glued over the black standard panel). This was usually included as part of the interior accent group option. Q: What's up with the speedometers? Q: Why is my shifter on the steering column? A: Because your car was ordered without the D55 console and it was equipped with an Automatic Transmission OR your car was originally equipped with a Powerglide Transmission. 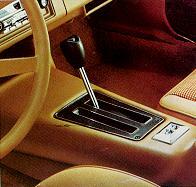 Manual shifters were on the floor regardless of the number of speeds or if the console was ordered. Q: What is the U14 Optional Gauge Package? A: U14 is special instrumentation, it includes speedometer and tachometer, and smaller temperature, ammeter (voltmeter began in 1976) and clock gauges in main panel. Usually required V8 engine. The standard "tell-tale" gauges comprises of a speedometer on the left, and a gas guage in the right center. The outer gauge pods are fitted with warning lights for oil, volts & temp. The gauges are driven by a circuit board. U14 gauges use a different circuit board than the standard guages. To tell the 2 boards apart is easy.... the standard circuit board has lightbulb sockets where tell-tale gauges go. U14 circuit boards will have provisions for the gauge sensors to screw into the circuit board (with round copper contacts where gauges would be placed). If you look at the circuit board, the black plastic plugs are the lightbulb sockets. Q: What type of Tachometers were offered, and what does a high red-line mean? A: Basically, a high redline tachometer indicated the guage was originally intended for use in a high performance (solid lifter) engine. Hint: - think Z28 or SS / pre-1973. The 8000 RPM tach was used exclusively in the 1970 - 72 Z28's and solid-lifter SS engines, with the majority of regular tachs maxing out at 7000 rpm. 1970 - 1978 - to 7000 rpm, yellow line at 4600 - 5000 rpm, redline at 5000 - 7000 rpm. 1970 - 1972 - to 8000 rpm, yellow line at 5600 - 6500 rpm, redline at 6500 - 8000 rpm. Q: What type of steering wheels were offered? A: Various steering wheel styles & horn button designs & insignia were used over the years. 1970 - unique to this year, this wheel had a hard plastic perimeter with a "thin" horn center section. 1971 & 1972 - had a hard plastic perimeter with "thick" horn center section. 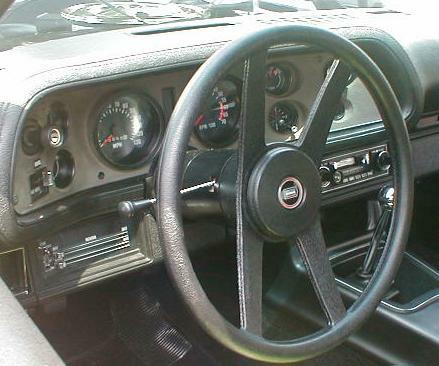 1972: optional 4 spoke steering wheel (RPO NK4) with round horn button available. 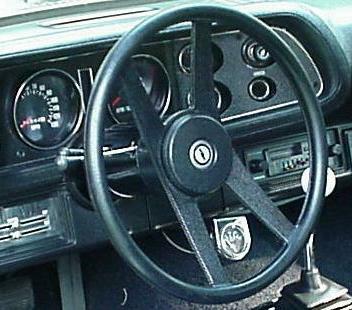 1973 - 81: The 1972 optional 4 spoke steering wheel became the standard steering wheel. 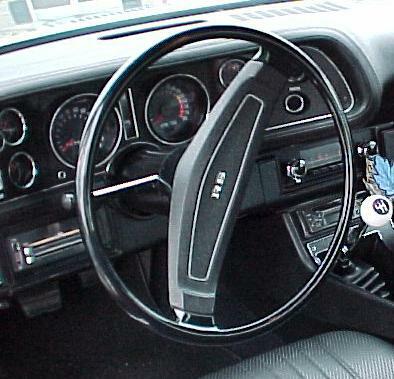 1977 - 81 Z28's had a specific "rope" style steering wheel. It was identical to the 4 spoke design, but with a simulated rope texture around the edges. 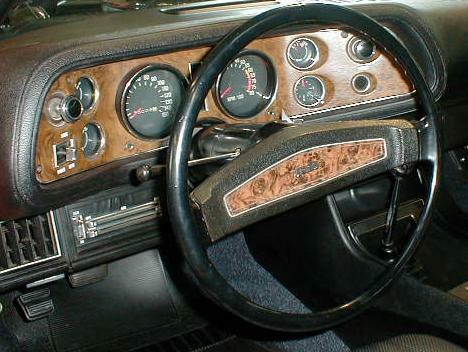 From 1970 to 1972 the standard steering wheel could also have a woodgrain applique in the center horn area if the custom interior was ordered. Starting in 1974 the steering wheel, column and dash color are coded onto the trim tag. In 1970 the Chevrolet Bow-tie insignia was on the steering wheel. 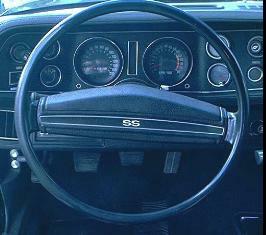 From 1971 to 1972 the standard model steering wheels had "Chevrolet" on them. If the car was a Rally Sport a "RS" would be on the steering wheel. EXCEPT if the car was also a Super Sport. If the car was a SS, the SS emblem would be on the wheel. If the car was a Z28 with the RS option - RS will be on the steering wheel. This is the only time you'll find ANY RS indication on a Z28 - Z28 and SS cars always trumped RS emblems - except for the RS/Z28's steering wheel emblem. Confusing eh? Hopefully I've elaborated this well enough to avoid further confusion. 4 spoke optional wheel used a pull off horn cap with an plastic insignia button inserted into the horn button. If the car was a Z28, the chevrolet bow-tie emblem would be used. In 1974 the Camaro & Z28 had a Camaro emblem horn insert. The Type LT has a unique horn button insert. There wasn't a specific "Z28" horn button insert until the Z28 became a specific model in 1977. A: The answer to the question is "no". 1970 - 1972 consoles differed from 1973 to 1981 consoles. The 1970 - 72 console is a hard plastic assembly made up of several individual components. It has seat belt holders built into the sides. It has 3 separate mounting brackets which secure it to the floor. The 1973 - 81 console is a single thin molded plastic base covered by vinal material. Both syle consoles have "change bins" in the front of them which is a recessed area underneath the radio location. In 1981 this part of the console is closed off so it can enclose the ECM (computer). This is unique to 1981. In addition to this, manual transmission consoles are different than automatic consoles. The automatic console has the shifter location right in front of the console lid, while the manual transmission console shifter position is further forward. This is NOT the case on the 70-72 consoles... the shifter location is the same on either console.